Remember when we were kids and we looked forward to our birthdays with gusto, crossing the days off the calendar as The Big Day grew closer? When our only worry on that day was how much birthday cake frosting we could stomach? Then, somewhere along the way—after we reached birthday milestones like the ones allowing us to legally drive, vote, drink, and rent a car—birthdays took on a bum rap. At some point in our journey, when the number of candles on the cake started posing a fire hazard, growing a year older morphed into a subject of complaint and, sometimes, even dread. Balloon animals and party favors got traded in for over-the-hill jokes and guilt about where we are or, as the case more often may be, aren't in life—not a fair trade in my book. In junior high, my girlfriends and I would pass the time on the school bus playing this game called "MASH," where we'd try to predict our future. 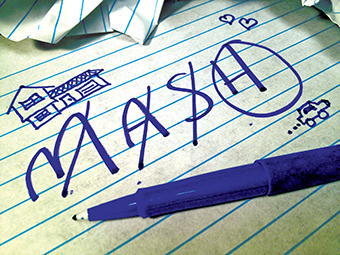 MASH is the acronym for Mansion/Apartment/Shack/House, delineating the potential choices for our future dwellings. We'd ask each other a laundry list of questions: What would we do for a living? Who would we marry? How many kids would we have? What type of home would we live in? We'd take out a piece of notebook paper and jot down multiple choices for each category. For instance, for the marriage question, we'd list a bunch of names of potential husbands, like the guys we had crushes on in our grade, and then add in some famous heartthrobs, like Kirk Cameron and Ralph Macchio, for good measure. Then, using the scientific "eeny, meeny, miny, moe" counting system, we'd select the answers to each category, right then and there designing our futures. If only we could use this system in real life. And if only the Karate Kid were still on the market. With my next birthday divisible by 5—the big 35—looming on Thanksgiving weekend, and the High Holy days of reflection in the not-too-distant rearview mirror, I've been thinking a lot about growing older and wiser, and some of life's biggest questions. On Rosh Hashanah, I joined my parents at their synagogue in Minneapolis. Their brilliant rabbi, Sim Glaser, recently suffered a burst appendix that almost killed him. Facing his mortality head on, he delivered a dvar torah urging each of us to examine our own life and death questions, in a productive and positive way. What, he asked, is our life's purpose? What were we put on this earth to do? I've thought about his sermon a lot over the last couple months and, needless to say, I'm still searching for the answers and probably will be for a long time to come. But what I do know for sure is that each one of us is meant to do many great things in this world. We're here to fulfill not just one, but many purposes in life, in our multiple roles as professionals, as parents, as offspring, as siblings, as romantic partners, as friends, as citizens of the world, as Jews, as decent human beings. All these years later, my friends and I are still playing the game of MASH. We may have answered some of the questions posed back on that school bus, but now we're figuring out the answers to more. In fact, if anything, we've actually added so many new questions to our list. And you know what? I don't think that's such a bad thing. We're not supposed to have life all figured out by 35 or really any age, because how boring would that be? It's the most Jewish thing in the world to keep questioning, keep striving to figure out who we are and who we're still becoming. There's the old adage that growing older is better than the alternative. Yep, that's absolutely true. But it's more than that. I say we adults take our cues from wise children everywhere and reclaim the joy that comes with celebrating a birthday. Growing a year older, and wiser, is a big deal—whether you're 5, 35, or 105. After all, celebrating that we were born, that we were brought into this fascinating, heartbreaking, and beautiful world, and that we're one year closer to figuring out who we are and what difference we're meant to make in this world is worth celebrating—preferably over birthday cake frosting.